Peach season will be coming to an end soon. In an effort to bring more peaches to the table I decided to create this Cast Iron Fresh Peach Galette for Two. It was so flavorful and rustic! I’m pretty sure you’ll want to make this! My recipe actually serves four people, but two per cast iron skillet. I adore peaches, in fact, if they don’t drip down my chin while eating they’re just not ripe enough. A perfectly juicy peach is sometimes hard to come by, but when they’re ripe they are oh so good! The best part about baking, grilling or broiling peaches is that they don’t need to be ripe. Once cooked they not only soften up, but become sweet and juicy. Making a peach pie or any pie for that matter can be intimidating for many. However, making a galette or Cast Iron Fresh Peach Galette is super easy, especially if you use ready-made dough. If I’m making homemade pie crust I prefer prepping it the day before, then prior to baking, bring it out to roll, cut, and fill. Midday Sunday my son and girlfriend decided to come over for dinner. 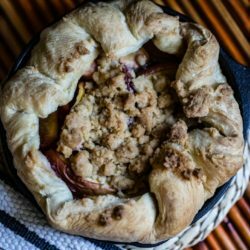 I always like to have something for dessert, so I decided to create this Cast Iron Fresh Peach Galette. Since it was a last minute decision to create I opted to purchase ready-made puff pastry. I purchased the DuFour brand a brand I’ve grown to love over the years. I could have easily purchased the Pillsbury ready-made pie crust vs. DuFour puff pastry, but Whole Foods didn’t carry it. Either would do or your favorite brand. The puff pastry will be more buttery and flaky. I like the ready-made brands because you can roll them out easily and place in your own bakeware. In my case I rolled each sheet out and set into the Cast Iron Skillet. It was perfect! I love creating desserts to share – it’s cozy, and if enjoying with a significant other, it’s romantic too! If you’re entertaining several couples, then each couple can share a dessert. How fun is that? 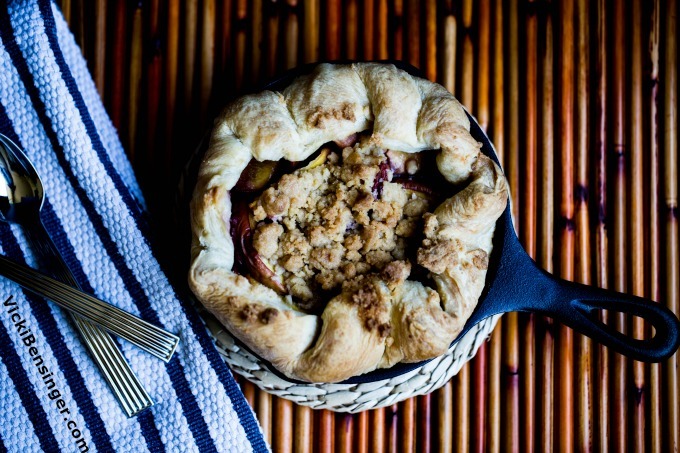 Plus, the Cast Iron Fresh Peach Galette is both adorable and masculine when served at the table with 2 spoons. Now I need to make a Cast Iron Fresh Blueberry Galette! YUM, I can’t wait to try that! 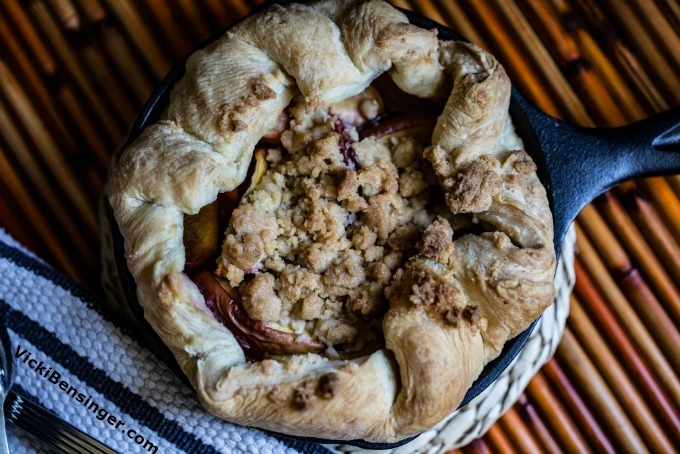 My Cast Iron Fresh Peach Galette has a crumb topping, adding that extra sweetness and crunch. It was sensational!!! I hope you’ll give this a try. 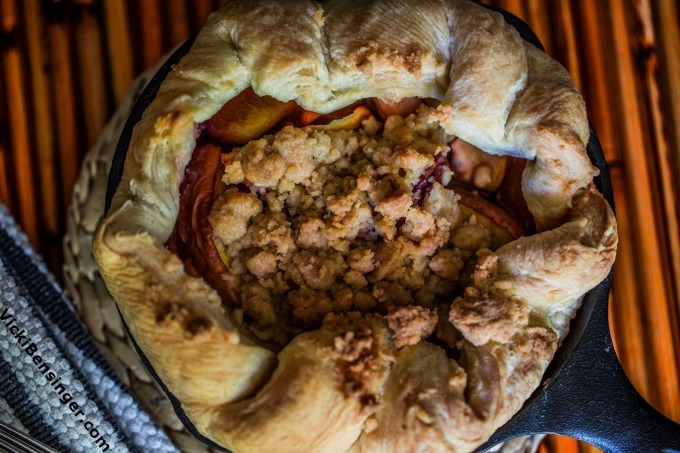 Share my Cast Iron Fresh Peach Galette with a friend or significant other. It's not only mouthwatering to taste, but cozy to share. Preheat oven to 350 F. degrees. Set aside two 6.5" Cast Iron Skillets (oiled). Filling Directions: Combine the peaches, brown sugar, cornstarch, and vanilla in a medium bowl. Mix and let stand while preparing the crumb topping. Streusel Directions: Combine the flour, superfine sugar, brown sugar, and cinnamon in a small bowl. Stir the melted butter and vanilla together in another small bowl. Gradually stir the butter mixture into the flour mixture, just until evenly moistened. Squeeze the mixture in your hands until thoroughly combined. Crumble the mixture in the bowl to make fine crumbs with some small lumps. Set the streusel aside. On a lightly floured surface, open one of the packages of ready-made pie crust or puff pastry, and unroll. With a rolling pin, roll dough to about an 1/8- inch thick. Using an 8"-8.5" bowl as a template, cut out 1 round of dough. Place round into a cast iron skillet gently pressing evenly into the corners. Let the excess dough hang over the top and sides of the skillet. Place in the refrigerator so it doesn't get too soft while working on the other sheet of dough. Repeat with second sheet of dough. Place both cast iron skillets onto a cookie sheet. Scoop 1/2 the filling into dough lined cast iron skillets. Fold excess dough over the filling – the center of the filling will be exposed. Gently press streusel over the top of the dough and filling of each skillet. Bake until tops are nicely browned, 50-60 minutes. If tops start browning too much, tent with foil. Transfer skillets to a heatproof surface and allow to cool, about 20 minutes. 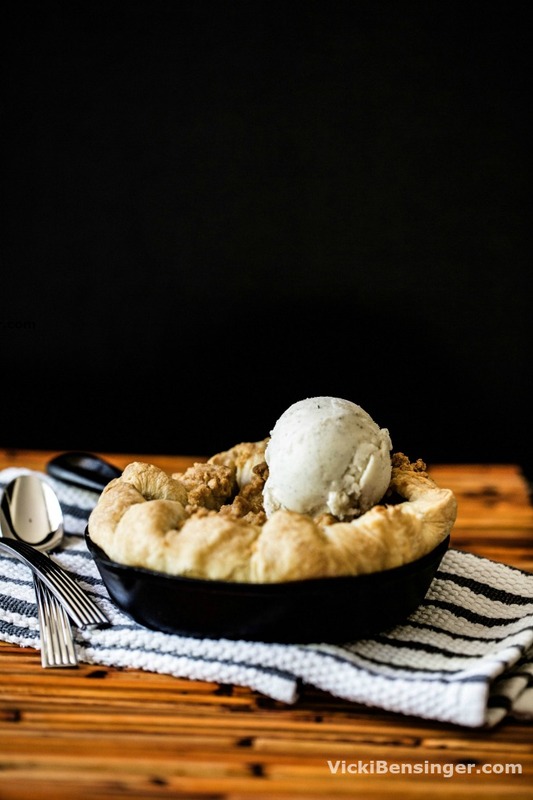 Serve warm or at room temperature with a scoop or two of vanilla ice cream for each skillet. Note: These would also be great made with apples or blueberries or a combination of any or all of them. I am drooling at that golden puffy crust! It was so good Angie and super easy to make. I hope you’ll try making it. I love peaches, puff pastry and the simplicity of galettes. This looks like a winner, for sure! It was so tasty and didn’t last long. I hope you’ll give it a try. I should be making more “for two” desserts! 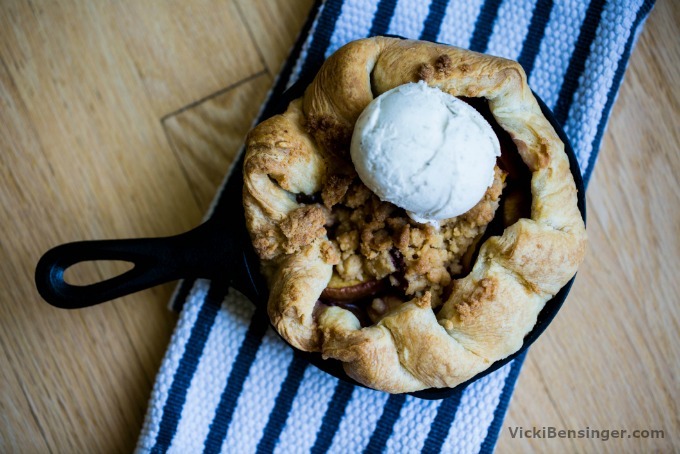 This galette looks terrific, Vicki! I know Liz. It’s too tempting when I make a large batch. We tend to eat it up ourselves unless I share it with the neighbors. I’m not sure they want to eat all those sweets either so cooking for two makes eating the desserts almost guilt-free! Love peaches! All summer stone fruit, really, but peaches are always the highlight for me. This looks great — love the rustic look of this. Bet the flavor is marvelous! Thanks so much. The flavor was great and so easy to prepare making it that much better. I love using those small cast iron skillets. They’re fun and somehow make everything taste fantastic! WOW Vicki! This looks delicious! I love puffy thick crusts like this and galettes are a fancy and fantastic way to enjoy peaches. Thanks!